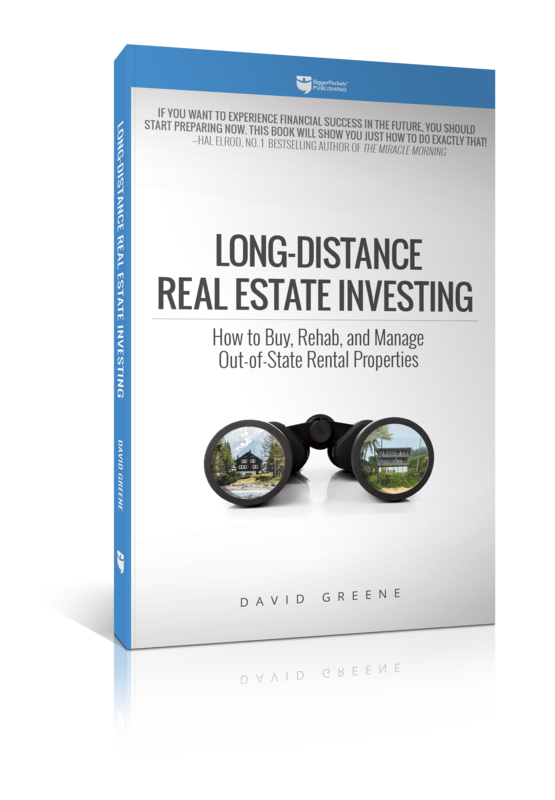 Introducing Long Distance Real Estate Investing: How to Buy, Rehab, and Manage Out-of-State Properties by David Greene. Is your local market keeping you from investing? Are you leery of investing in a property where you can't just drive by it any time you like? David Greene helps you lay your fears to rest and shows you exactly how to invest "outside your backyard." EXTRA LAUNCH BONUS: Exclusive Live Webinar with David Greene! Don't let your location dictate your real estate investment strategy! Order your copy of Long Distance Real Estate Investing here . Amazing!! I have been looking for a good source of information on this topic for awhile! Currently doing just that from California to Florida. I’m going to buy this and see if I can make my operation even better! The paperback book is available on Amazon for $17. How come BP is selling for for $24.99? And the Kindle is only $10 on Amazon. Any difference between these? Can't wait to get the bonus content on this one! I own in 5 markets with 5 different property managers. My advice would be to stay local my friends. @Derek P. So you regret investing out of state ? I think if you are willing to travel 2-4 times a year to check up on these places and your team you will be in good shape. Too many people entrust their money to someone else and it is out of sight out of mind until something goes wrong and then its too late. I think investing out of market is ok, just stay close. Can you get there within a few hours by car or by airplane? Oh i hear you, i currently own in 2 different coasts. Me and my partner are looking at properties spanning multiple states. This will be perfect. Probably pick this up next week. Perfect timing - I'm looking to implement an out-of-state strategy soon. Talk about perfect timing. I am getting ready to invest out of state. You don't follow your own advice? @Katie Askew, where do I send the receipt of payment for the bonus content? My goal is to invest out of state in 2018. I have been looking forward for the release of the book. I pre ordered the book can't wait to get the extras can't wait for the webinar oh yeah!!!! Yesterday I bought the Kindle version, CAN NOT WAIT FOR THE BOOK!!!!! Literally have been looking at investing in a home for the past week while I'm oversea's and came across this. Almost perfect timing. Are you guys mind reading me?! Mixed reactions from investors on out of state investing. Is that because some investors do not have a proper system and process in place ?. I am an Atlanta base investor looking to invest in multifamily in Chattanooga which is 2 hours from home.